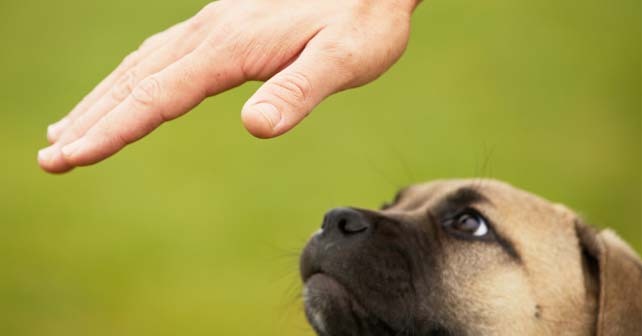 Teaching the ‘Stay’ command is one you’ll want to practice with your dog as soon as possible. There are sometimes situations where you’ll need the animal to be obedient for the dog’s own safety for instance, if you need to open the your front door and don’t want to dog to run out into potential traffic, the stay command will tell your dog that it needs to wait patiently. If you have one, put a training leash on your dog. This command can be taught without using a leash but the length of the training leash makes it easier. If your dog is already aware of what the leash means, he may get overexcited, let him calm down before you continue teaching. Get your dog’s attention, and tell him to sit. If he breaks out of his sit and starts to walk towards you immediately use the leash to guide him back to where he was sitting and get him to sit again. Repeat this process until the dog allows you to walk several paces away. When you’ve reached around 5 steps away call the dog to you, offering significant praise as well as a treat. Repeat the steps again until he associates the word ‘Stay’ with remaining where he is. Remember, always stay calm. Perseverance is the key to this trick, your dog should quickly learn the behaviour that is being required of it.